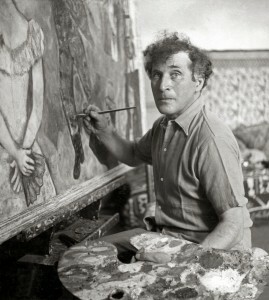 Born in Russia, Chagall moved to France in 1910. Marc Chagall’s poetic, figurative style made him one of most popular modern artists, while his long life and varied output made him one of the most internationally recognized. While many of his peers pursued ambitious experiments that led often to abstraction, Chagall’s distinction lies in his steady faith in the power of figurative art, one that he maintained despite absorbing ideas from Fauvism and Cubism. 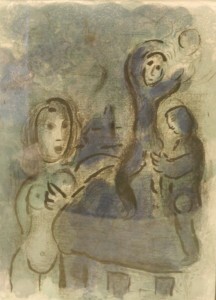 Later he spent time in the United States and the Middle East, travels which reaffirmed his self-image as an archetypal “wandering Jew.” Chagall’s Jewish identity was important to him throughout his life, and much of his work can be described as an attempt to reconcile old Jewish traditions with styles of modernist art. However, he also occasionally drew on Christian themes, which appealed to his taste for narrative and allegory.